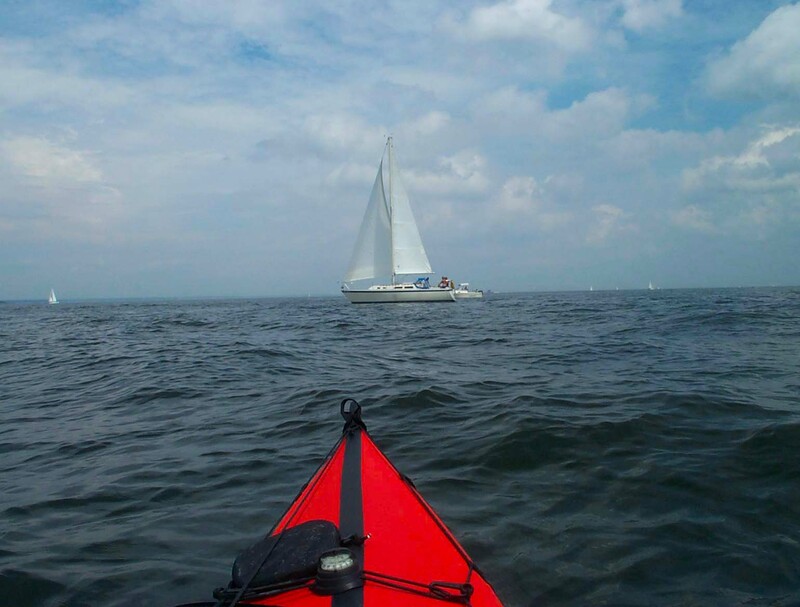 Now that Johna and I are back from our New England kayaking trip (photos here, writeup still to come), it’s back to my regular old paddling routine in New York Harbor. 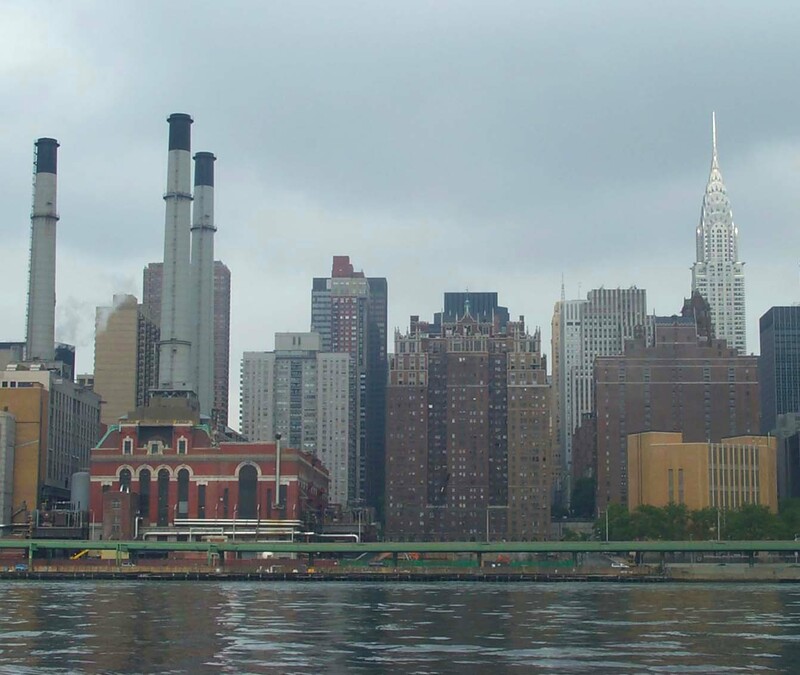 On water as on land, the idea of New York City arouses strong emotions. 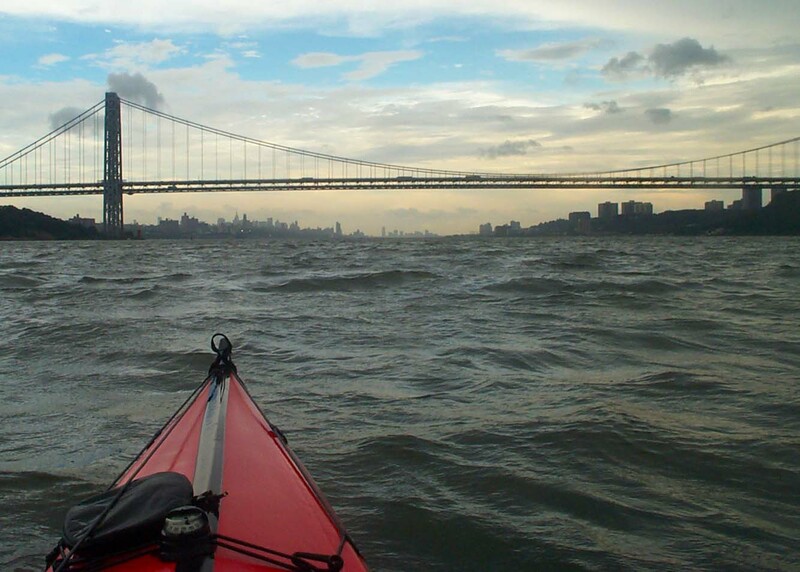 Expressions of horror greet any mention of kayaking in New York City. Aren’t there dangerous, dark currents sweeping one under piers; tugs, ferries and huge container ships trying to run one over; sewage in the water, floating bodies…? 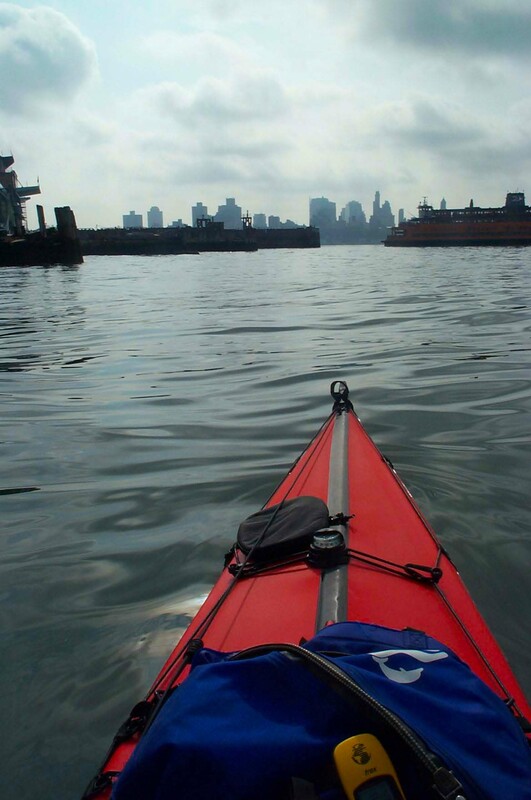 Yes, paddling in New York City has a decidedly urban edge to it. But tense moments dodging motorboat traffic and grand architectural vistas give way to quiet marshes and beaches—with only the glimpse of giant rats among the rocks and the odd condom as a reminder that this is still the City—just around the corner of the waterway. All of the photographs in this report were taken within the boundaries of New York City, on a trip in August 2003. I do this trip often. 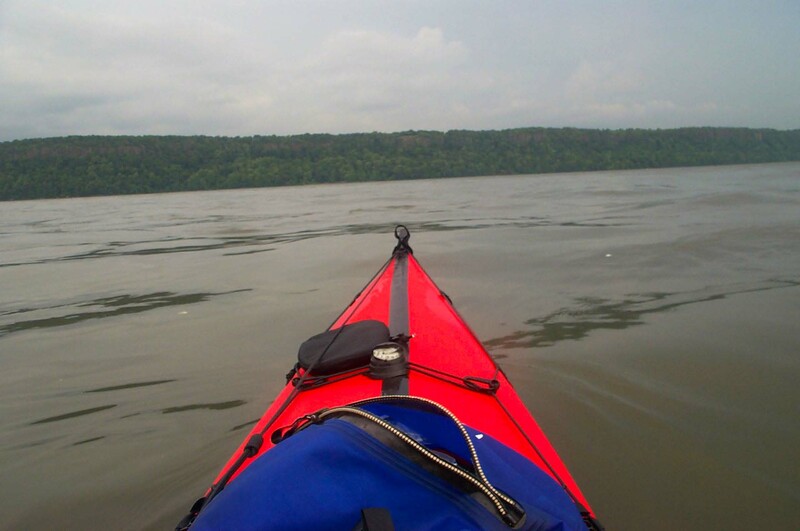 Although it is a 50 nautical-mile trip, it feels much shorter: the secret of New York paddling is to let the strong tidal currents, which run at 6 knots or more in places, do the work. Leaving Pier 40 on the west side of Manhattan, I paddle down the Hudson River to the Battery, the southernmost point of Manhattan. A peculiarity of the currents in this area is that for almost two hours in the tidal cycle the current is still ebbing down the Hudson west of Manhattan but is already flooding up the East River east of Manhattan. (The simple idea that current begins to ebb at high water and flood at low water fails miserably around New York.) This phenomenon will effortlessly sweep the boat round the southern tip of Manhattan. Unfortunately, this area is also the focus of innumerable ferries—the Staten Island ferry, water taxis and commuter ferries, and the fleet of ferries that take tourists to Ellis Island and the Statue of Liberty (once I counted nine of these ferries milling around off the Battery at the same time)—as well as tugs, barges, motorboats, and sailboats on passage between New York Harbor and Long Island Sound through the East River. The wakes of all these boats, bounding and rebounding off the piers and seawalls and piling up in the tide rips, add up to a surprisingly rough, confused stretch of water, even on a completely windless day. Paddling off the Battery during weekday rush hour, or on a nice summer Saturday afternoon, can be a high-energy proposition. But now on Sunday morning there are just a few ferries to contend with. I backpaddle in the current to let the Staten Island ferry dock in front of me to the left, then slip through the long tail of its prop wash to avoid a tug and barge coming against me on the right, into the East River. Looking back just before the strong East River current picks me up and sweeps me around the corner, there across the harbor is the Statue of Liberty. The East River current accelerates me to 7 knots (I have my GPS on deck) and sweeps me, in quick succession, under the Brooklyn and Manhattan Bridges. As I usually do when going with the current, I keep to where the strong current is, well away from shore. 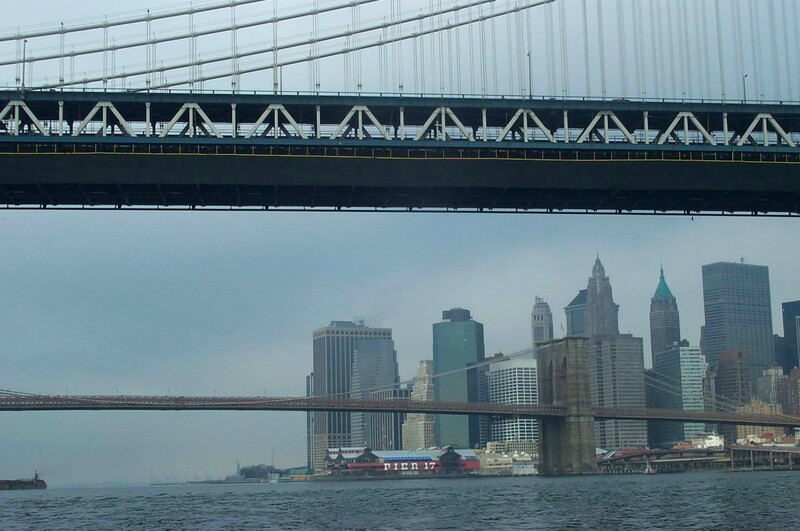 In any case, as the sight of a blue police boat on its habitual station under the Brooklyn Bridge reminds me, it is now forbidden to approach close to any piers, bridge abuttments, or other waterside installations—almost any point, it would seem, along much of the shoreline of New York City. Paddling along the shore, it would also be very easy to get tangled up in the often completely invisible lines of the fishermen casting off the piers, and would present an inviting target for rock-throwing children (I have been attacked four times)—another urban paddling hazard they don’t tell you about in kayaking school. Paddling in the channel, however, requires constant alertness. A rapidly gaining ferry, or a tug pushing a huge oil barge, can materialize behind in no time or, worse, suddenly push off from any number of hidden spots to the side. Even from among decayed piers, with loose timbers swaying in the current and trees already established on top, a live tug can suddenly emerge. Practically on every trip, I notice a fresh ferry landing that has sprung up in a previously safe corner. The current sweeps me past the spires of Midtown, then accelerates as it squeezes into the narrow strait between Manhattan and Roosevelt Island toward Hell Gate. Views down successive cross-streets of Manhattan open and close with amazing rapidity; I am easily passing all but the fastest joggers on the Manhattan promenade. On occasion I have hit 12 knots here. Today the current is slower and only a few small whirlpools have developed along the eddylines, but sometimes, especially on the ebb with heavy boat traffic, this stretch can resemble a whitewater river, with spectators cheering from the overlooking ramparts of Manhattan. Further along in Hell Gate itself, there is a large but superficial whirlpool which can, however, get interesting when wakes become trapped in it. Being swept toward the blind corner of Hell Gate, too, one never knows what monstrous barge might suddenly emerge, apparently filling the entire river with no room for even a kayak to squeeze by. Then the current eases into the upper East River. I pass the guard towers and razor wire of Rikers Island (opposite there is a prison barge from which I sometimes hear shouts of the inmates), the runways of La Guardia where, when the wind is right, the stream of landing planes passes directly overhead, then under the Bronx-Whitestone Bridge, and finally, two and a half hours after leaving Pier 40, under the Throgs Neck Bridge into Long Island Sound. Turning the corner of Throgs Neck is like entering another world. If one makes the effort to see them, the towers of Manhattan are very small on the horizon behind. In front the broad blue Sound opens up, dotted with white sailboats. The current dissipates, and I paddle slowly past the lighthouse marking Stepping Stones shoal, where dozens of motorboats are anchored fishing, to Hart Island. Big fish are jumping around the boat as I paddle. There are gulls, terns, and cormorants; in the winter, loons and rafts of ducks. In the sea-grass along the shore stalk herons and egrets. One winter I saw porpoises here, diving for fish. However, not everything is idyllic. The lush green Hart Island is actually a vast cemetery—New York’s Potter’s Field—with as many as 1,000,000 people buried here since 1869. Once or twice, I have encountered off Hart Island police boats and helicopters searching for (and, after I had left, finding) drowned bodies that come to the surface in the spring. 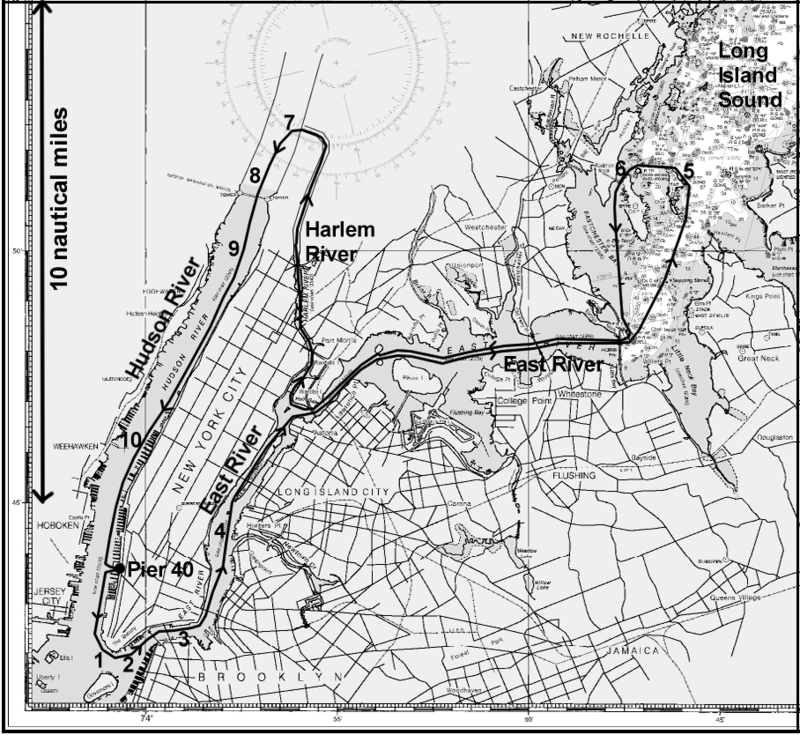 I complete a loop around Hart and City Islands back to Throgs Neck, where I plunge back into the East River. The current has now conveniently turned and within an hour the ebb carries me back to Hell Gate. There I turn right into the Harlem River, still riding the ebb current which here doesn’t flow south as in the Hudson and East Rivers, but north. The Harlem River is an unremarkable narrow, straight-sided canal relieved only by numerous old bridges; unfortunately, from below I can see only too clearly their rusting decay as well as the piles of trash, and here and there encampments of homeless people, along the banks. The end of the Harlem River, however, comes rewarded with a sight that always momentarily takes my breath away. After more than an hour in the narrow confines of the Harlem River, and finally passing under a low railroad bridge that obscures sight until the last second, I burst out into the broad expanse of the Hudson. A mile across the river, the unbroken green of the Palisades stretches north into the distance. Often an orange setting sun completes the picture. Facing west here, one can almost believe that things are still as they were a thousand years ago. Of course, turning south down the Hudson, the illusion is shattered: the huge George Washington Bridge swings into view, and behind it the skyscrapers of downtown Manhattan. Almost home—only another 10 miles to go, no more than an hour and a half with the strong ebb current. 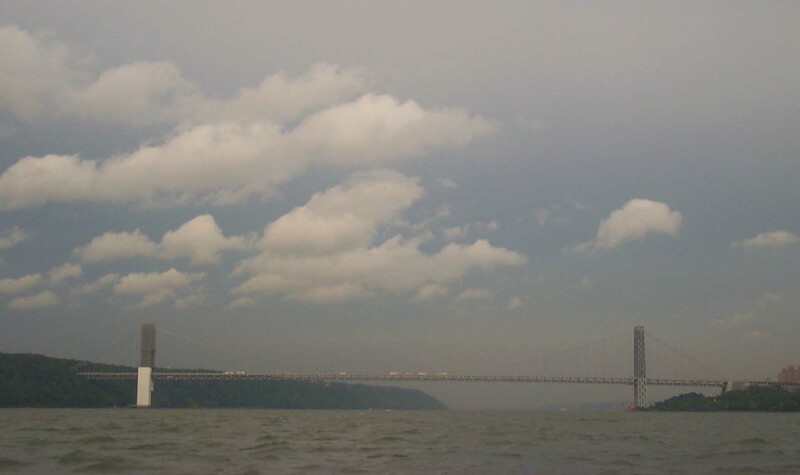 The day has been mercifully overcast—the most unpleasant thing about kayaking in New York is the summer heat—but now serious dark clouds are gathering to the north. No thunderstorm materializes, however, and the sun even makes a final brief appearance. I watch a quiet sunset reflecting off the glass towers of Midtown as I paddle past before reaching Pier 40 as dusk falls. 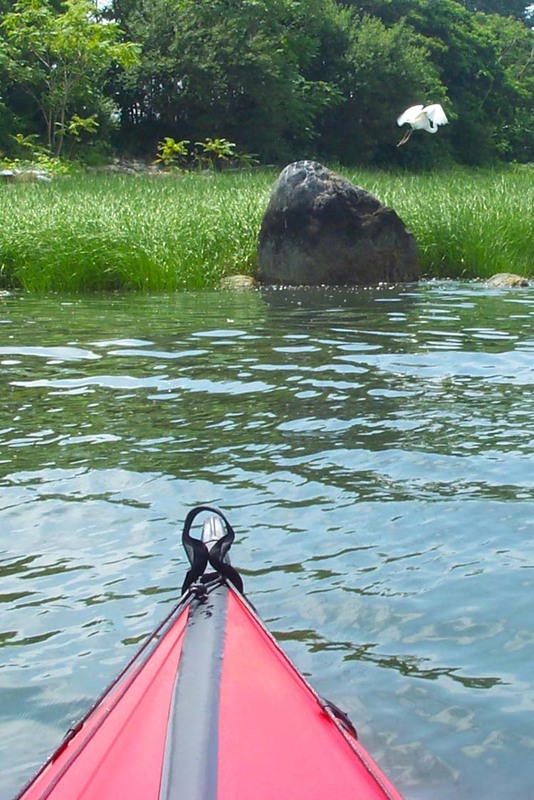 This entry was posted in Kayaking, New York City and tagged East River, Harlem River, Hell Gate, Hudson River, Kayaking, Long Island Sound, Manhattan, New York City, New York Harbor. Bookmark the permalink.